The Woodhaven Residents' Block Association is proud of the Memorial Day traditions that have endured in the neighborhood for decades, and it encourages area residents to participate in them. The WRBA thanks American Legion Post 118 for the "Garden of Remembrance" -- a memorial garden containing nearly 700 crosses or Stars of David, each adorned with an American Flag and a Red Poppy flower, representing a local veteran who is no longer with us. The garden will be up for about the next 10 days. The Legion members themselves used to put the garden together, but as they grew older and the number of crosses expanded, it became increasingly difficult for them to continue. However, the ROTC from Franklin K. Lane stepped up and took over this solemn duty. This past weekend, they were readying the garden for next week's Memorial Day ceremony. The ceremony will take place on Monday, May 31 at 11:00 a.m., on the corner of 89th Avenue and 91st Street. 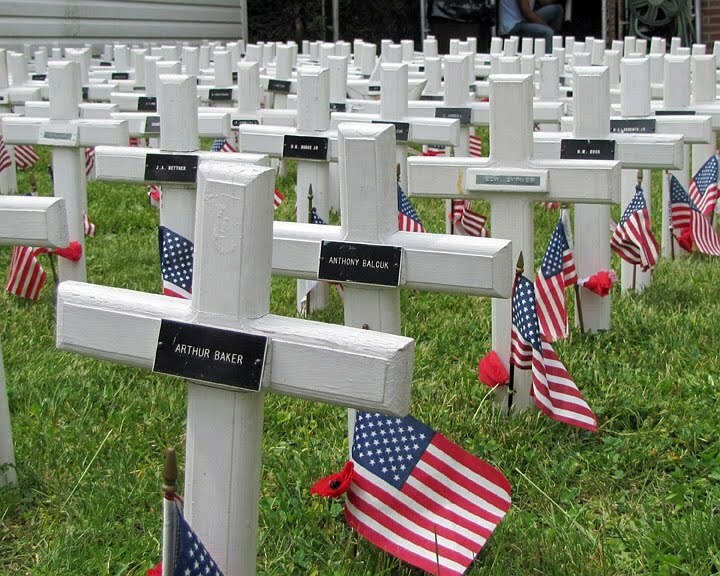 "Each and every cross that you see in Woodhaven's Garden of Remembrance represents a veteran, as well as a former resident of Woodhaven," said WRBA President Edward K. Wendell. "We are very grateful to the American Legion and Franklin K. Lane's ROTC for continuing a wonderful tradition." 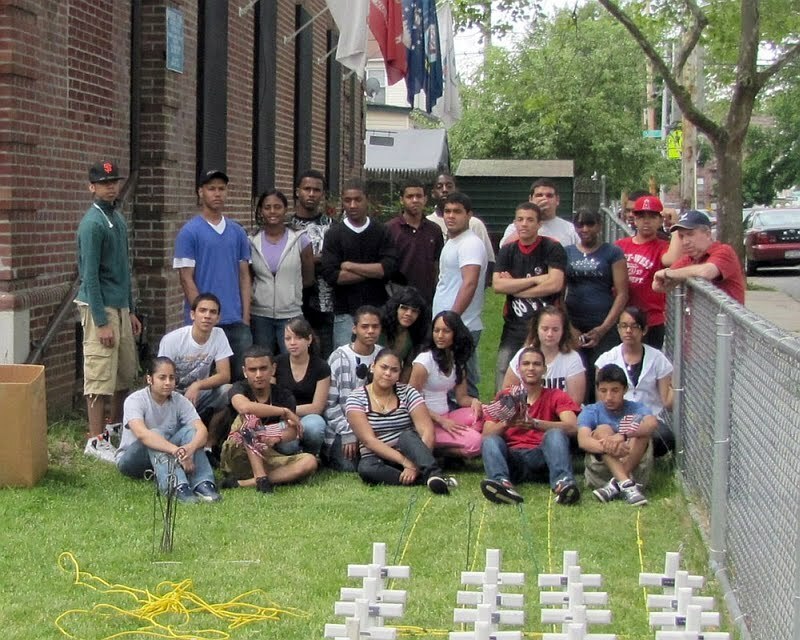 The Franklin K. Lane ROTC and American Legion Post 118 will also team up with the Greater Woodhaven Development Corporation for a memorial ceremony on Thursday, May 27 at 6:30 p.m. This ceremony will take place at the memorial at Forest Parkway just off Jamaica Avenue. 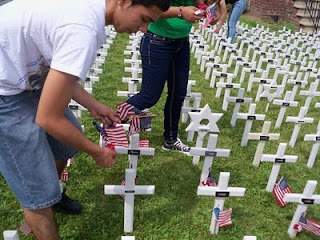 Photo 1 - A member of Franklin K. Lane's ROTC program puts an American Flag and a red poppy flower on one of the nearly 700 crosses or Stars of David in Woodhaven's Garden of Remembrance. 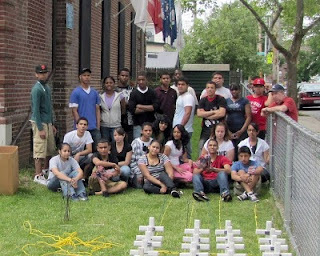 Photo by Josephine Wendell / Project Woodhaven. Photo 2 - Franklin K. Lane's ROTC led by Chief Master Sgt. Jose Silveira (at right). Photo by Joseph A. Virgona. Photo 3 - One of the nearly 700 crosses or Stars of David in Woodhaven's Garden of Remembrance, each representing a local veteran who is no longer with us. Photo by Joseph A. Virgona.